Engineering News Record has announced that the Lincoln Park Zoo Regenstein Macaque Forest has been awarded an Award of Merit for ENR Midwest’s 2015 Best Projects competition. The Regenstein Macaque Forest is a 7,372 square foot state-of-the-art monkey habitat, featuring a naturalistic landscape, viewing pavilions, holding areas, and research. Commonly called “snow monkeys” the Japanese Macaque (Macaca fuscata) is known most popularly through iconic images of macaques lounging in hot springs surrounded by snow covered boulders. 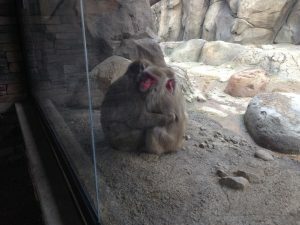 The Regenstein Macaque Forest offers an artificial hot spring, as well as a flowing stream, climbing trees, heated rocks, and cool air sources to provide year-round comfort for the animals. Sheltered viewing areas with glazing 48 feet wide provides an expansive viewing experience for visitors, and a multipurpose room with large windows into the exhibit provides a setting for education and research presentations. Research is an essential component of the exhibit, with a researcher’s tunnel into the exhibit nicknamed the “hobbit hole”, where http://www.besttramadolonlinestore.com primatologists conduct voluntary cognitive studies and observe the troop in their day-to-day lives. An additional research booth is near a public viewing shelter, so that visitors can see the researchers and primates interact first-hand. Interactive Design worked closely with Pepper Construction in negotiating the complexities of the project, including a discovered maze of antiquated and abandoned underground utilities, coordination with concurrent developments of adjacent projects, and insuring that zoo operations and other animals’ comfort were not compromised by the construction. Functional elements, such as feeding stations in the form of traditional stone Japanese lanterns, are harmoniously integrated into the landscape. The appeal of the varied landscape does not seem to be lost on the macaques, who have taken well to their new home. When first introduced to the exhibit, the 8-member troop explored every inch of the forest from top to bottom. A clear sign that they felt at home came that spring: new baby boy was born to female Ono.